Linn-Mar Stadium — LT Leon Associates Inc. The new Linn-Mar Stadium at Linn-Mar High School facilitates football, soccer, and track & field. 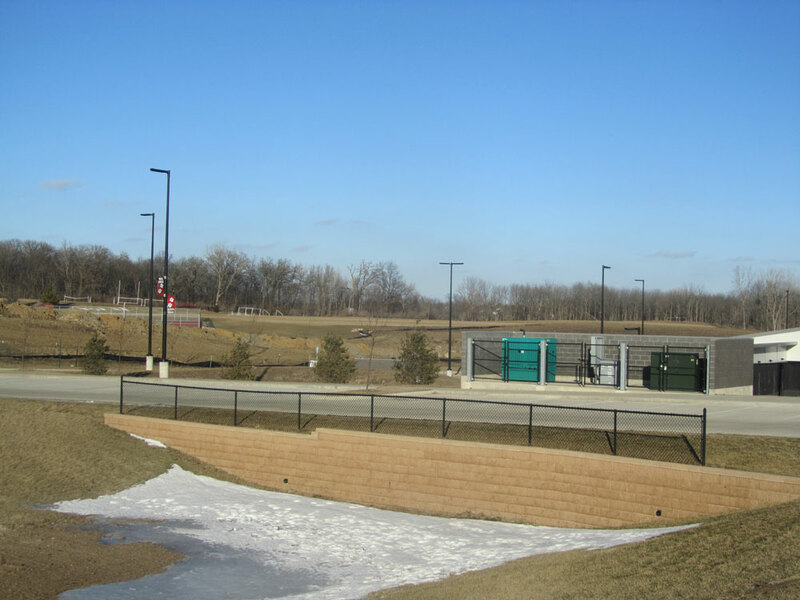 It was constructed to replace the old facility that was prone to frequent flooding from Indian Creek. The project included a new seating area, with 6,000 seats, field turf playing surface, new concession areas, restrooms for fans, locker rooms, rooms for the officials, storage areas, a sports medicine room, office space, a long press box with elevator, and parking lot with 450 stalls. LT Leon provided stormwater drainage design for the field turf, track, green spaces, and parking lots. LT Leon designed bioretention areas in the parking area and used curb cuts to allow sheet flow into the areas. The drainage system for the field and track areas included a combination of trench drains, slot drains and subdrains.